Welcome to the neighborhood! 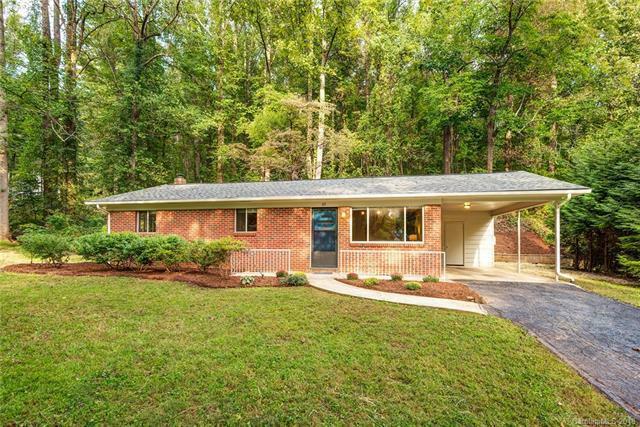 This adorable brick ranch is perfectly sited on a triple corner lot, framed by beautiful old growth trees. Inside the home you will find custom architectural upgrades, such as modern built-ins, recessed lighting and a dedicated laundry room. The kitchen overlooks a private backyard, with a large patio for dining. Entertain on chilly nights by the outdoor fireplace and pergola. Carport with storage makes parking and carrying groceries into the house easy as pie! Don't feel like cooking? A quick walk around the corner brings you to an Asheville favorite - 12 Bones BBQ! Brand NEW ROOF, fresh paint inside and out, professionally done low maintenance landscaping and stone drainage just completed. Perfect starter or retirement home! The data relating to real estate on this Web site derive in part from the Carolina Multiple Listing Services, Inc. IDX program. Brokers make an effort to deliver accurate information, but buyers should independently verify any information on which they will rely in a transaction. All properties are subject to prior sale, change or withdrawal. Neither Miller Realty Group | Keller Williams nor any listing broker shall be responsible for any typographical errors, misinformation, or misprints, and they shall be held totally harmless from any damages arising from reliance upon this data. This data is provided exclusively for consumers' personal, non-commercial use and may not be used for any purpose other than to identify prospective properties they may be interested in purchasing. © 2019 Carolina Multiple Listing Services, Inc. Data last updated 2019-04-25T16:59:10.797.